This post will show you how to get the most out of all of the sign-up referral bonuses on Lyft, Uber and Sidecar. I have been driving for ride-share companies for the past 2 years now and have found it's an excellent way to make some extra money on the side when I need it. I've also heard that some people have even made it into a full-time job! If you've been thinking about signing up to drive, there's never been a better time than now! You will have time-freedom: you can work any time you want 24/7 and you don't have to sign up for shifts. You can sign in and sign out whenever you please. You won't have a boss: You're your own boss. You can make on average $19-$40 an hour: Yep, that's true. Certain times of the day can be busier than others, especially if there's a large event going on where people need rides. When the demand for rides are higher, an extra surcharge is applied, which means you make more money! Direct deposit right into your bank account weekly: No waiting on checks, everything is seamlessly dropped right into your bank account in 5-7 days. Use "TARA666" to get a driver referral bonus when you sign up for Lyft! For more info on Lyft's terms, click here. Use "UBER94UND" to get a driver referral bonus when you sign up for Uber! You get $100 if you're a new driver, not already on another ride-share platform and $500 if you've been driving for another ride-share before 3/31/15. To find out if your city is on Uber, click here. Use "TARA343" to get a driver referral bonus when you sign up for Sidecar! *These amounts may change. Terms and conditions apply. Earnings may also depend on the city. Please refer to each company's website for up-to-date details. Use These Referral Codes to Get a "Driver Referral Bonus"
Once you're a driver, you will receive your own referral code, which you can use to refer other drivers and/or passengers and make some extra money. So be sure to get your code out there! Sign up for Lyft and work on completing 30-50 rides, within 30 days, in order to get your bonus. Wait 2 weeks to 3 months (depending on the current promo) and then sign up for Uber. You'll get a bigger referral bonus this way because you already drive for a ride-share. Sign up for Sidecar. I put this one last simply because I've found that it's not as well-known or as busy as the other two, and the sign-up bonus is less than the others. If you really need more money and fast, follow the steps I recommended above. If you don't need money as fast, you could sign up for Sidecar first instead of Lyft, but always wait to sign up for Uber after you're already a ride-share driver with another company because then you'll get a bigger bonus from them. From my own experience, I have found that I make the most in the least amount of time on Uber, so it has been my #1 to promote, seeing that time is money. For more information about signing up for Uber, check out this blog post I wrote about 6 months ago. What if You Are Already Driving for Uber? If you have friends who are driving for Lyft or Sidecar, recruit them to drive for Uber! You'll both get a $500 bonus after they complete just 20 trips! You could also play "passenger" and take a Lyft or Sidecar to where you need to go. Ask your driver if they also drive for Uber, and if not, ask them if they would ever consider it. Definitely let them know about the $500 Uber bonus after just 20 rides; that is what sold me to sign up for Uber last November and am very grateful for the person who told me about this because it changed my life! Read my story here. 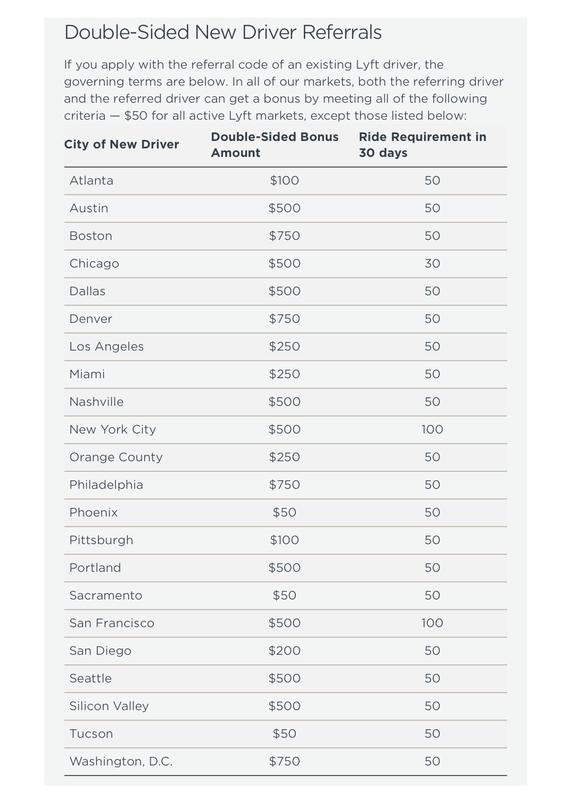 If they don't really want to drive for Uber, they could at least take advantage of the bonus just by signing up and doing the 25 rides, and then going back to driving for Lyft and/or Sidecar. You'd both still get $500 😉 But then again, who knows, they might also find they like Uber better! Read my other story here.